No, maglev people suckers are not alien beings out to destroy the human race, nor are they a medical device to draw out poisons through a person’s skin. Using large vacuum tunnels, trains would be propelled from one destination to by sucking out the air at the destination, in a manner similar to how documents in plastic capsules are whisked through buildings such as banks, or in “olden” times by department stores. The maglev (magnetic levitation) part would suspend the vactran in air, eliminating friction from rails. There would be no kid derailing your train by putting a rock on the track. The system would be safe from stray cars, people or cows passing over the tracks-no “cow-catchers” required. Vactrans, by combining pneumatic technology with magnetic levitation, could support speeds up to 2,500 mph according to the BBC. That’s an order of magnitude faster than today’s 200 mph high speed rail. American engineer Daryl Oster has designed a small 6-person vactran which travels through a 5-foot diameter tube which he calls Evacuation Tube Transport (ETT). Oster has sold 60 licenses for his patented technology, including 12 to China. The Korean Rail Research Institute has announced plans to build a tube transport system with a design speed of 700 km/h (420 mph). Oster estimates even higher speeds, stating that such a system can achieve possible speeds of up to 4,000 mph or New York to Los Angeles in 45 minutes. Or how about New York to Beijing in 2 hours! If you live in Singapore, you could make it over the 17 miles from Jurong West Town to Changi in well under half a minute, but you better be wearing a fighter pilot’s G-suit. In terms of energy, Oster claims that the ETT could “provide 50 times more transportation per kilowatt hour than electric cars or trains,” Moreover the ETT’s cost of construction would be a tenth of high-speed rail and a quarter of freeways. 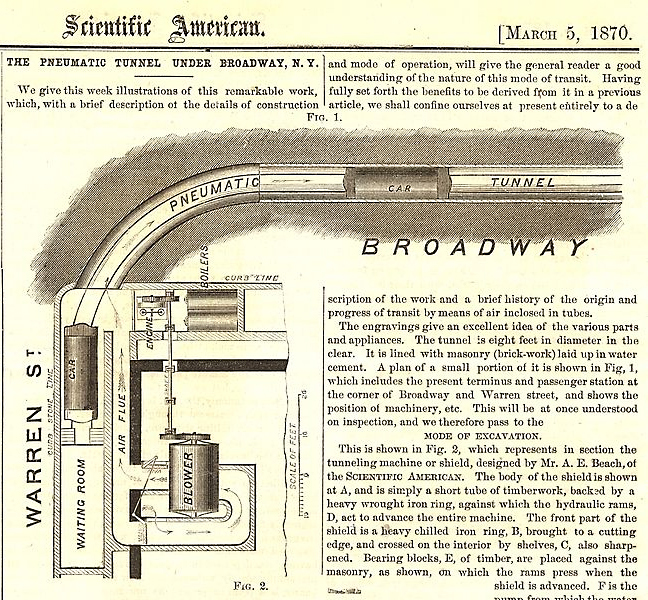 What is surprising is that there way back in 1870, Alfred Ely Beach demonstrated and opened a subway line under Broadway that employed a large pneumatic tube to propel riders. Beach operated his railway from February 1870 to April 1873. It had one station in the basement of Devlin’s clothing store, a building at the southwest corner of Broadway and Warren St, and ran for a total of about 300 feet to the south side of Murray St. Apparently, the Beach pneumatic tube subway was driven out of business by powerful financial interests. Beach himself contended that infamous Tammany Hall ruler “Boss” Tweed killed the Beach’s pneumatic subway. we have all the oil lobbyists running in and around Washington DC, smootching up all the senators n congressmen, that’s WHY we don’t have this here! their all running to china and korea! Yes, big business, oil companies have driven our trains to the ground,… instead, they use their roads, and their 18 wheeler trucks, hauling goods, all over the place! our system is broke! wait till Romney gets to be President. We will be fighting iran, and more wars, for his war buddies to make their kaching! It’s a sad day, when we have AMERICA have the technology to do all of this stuff here! and their all going to china and korea! thanks for this great post. Singapore’s LTA will have something to think about for our rail system. We could really move tons of people at a faster rate, and get them to their destinations. Office Work can start at 7am! This is fantastic. I hope to experience this type of travel when I visit China in the future. Many thanks! Phenomenal concept. We should have this here in Singapore. everyone move faster, instead of waiting for the slow trains. This concept of travel is great for Singapore.